This delicious recipe is brought to you by Sara Lee® Artesano™-style bread. 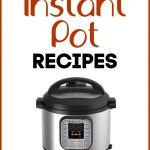 Thanks for supporting my blog and its sponsors! 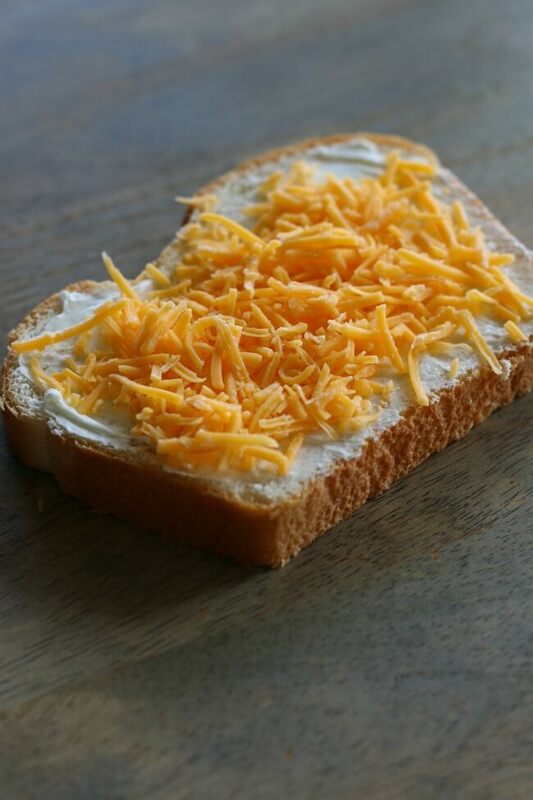 What happens when you spread cream cheese on thick and soft slices of white bread, top it with sharp cheddar and then grill it? Magic. That’s what. I can’t believe that I’ve never thought about spreading cream cheese on a grilled cheese sandwich before. It’s amazing. 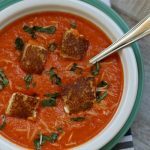 And it’s even better when you serve that perfect grilled cheese sandwich with roasted red pepper soup (one of my very favorite soups ever). 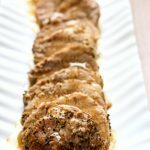 This meal idea (a perfect lunch or dinner) is so easy to make but will leave you immensely satisfied. 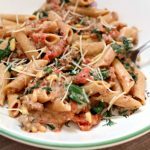 Just writing this post right now is making my stomach growl. You may know by now that April is National Grilled Cheese Month. We still have a few days left in April. Let’s make the best of it. 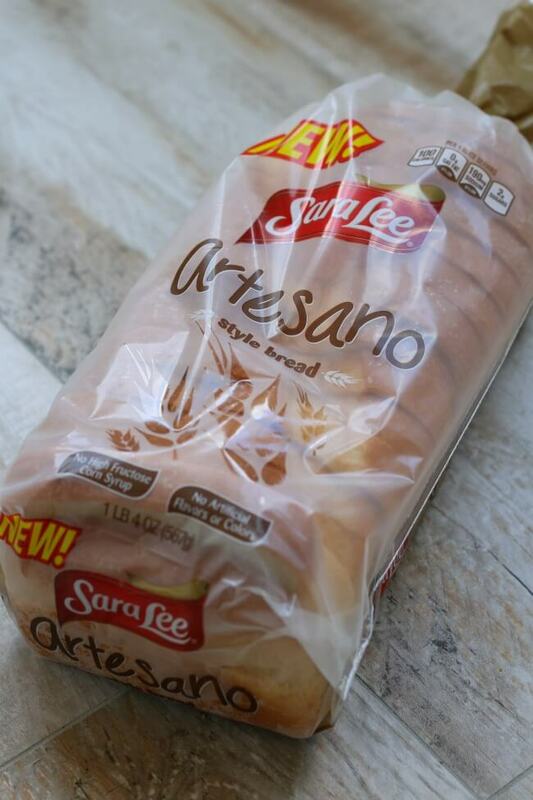 Let’s start with purchasing the new Sara Lee® Artesano™ bread. It is the perfect bread for grilled cheese. On Sunday I made my family grilled cheese sandwiches with it and we all just kept saying “I’ll go halfsies with you on the next one…” Our intent was to eat half a sandwich but they were just so good we kept eating more and more. This new bread can be found at Walmart by all the other breads…except it’s a bit more fancy than the other loaves on the shelves (although it’s only $2.99 per loaf). It’s sliced thick with a soft texture and *bonus* it’s made without artificial colors or high fructose corn syrup. The hearty Italian slices will hold strong under the weight of the gooey cheese, but won’t overpower your fillings. It also crisps nicely on the outside, while the inside remains soft and fluffy for when you dig in. I think the crisping of the bread was my favorite part of the grilled cheese sandwiches. I started making the grilled cheese by spreading some softened cream cheese on the bread and then topping with some sharp cheddar cheese. I grilled in a pan for about 3 minutes on each side. And then I cut the sandwich up into bite size pieces–AKA the croutons. 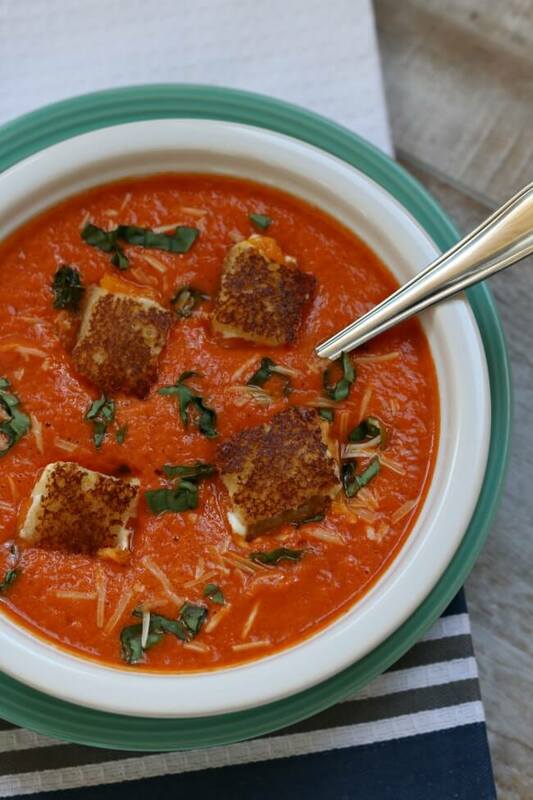 To me, soup and grilled cheese just go together like peanut butter and jelly. If you’re having a tomato soup or a roasted red pepper soup you just need a grilled cheese. And what’s even better is if the grilled cheese is cut up and thrown into the soup itself. Try it! I know you’ll love it. Creamy and cheesy, this grilled cheese is the ultimate comfort food. I like to serve the grilled cheese sliced up into little squares in my red pepper soup. Completely butter one side of each slice of bread. On the opposite side or each slice of bread spread the cream cheese. 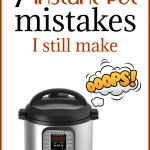 Turn the heat down to medium-low and cook until golden brown and crispy, about 2-4 minutes. 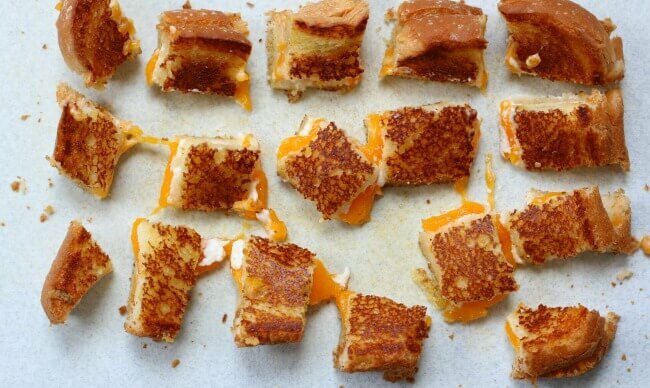 Cut the grilled cheese sandwich into 1 inch squares. Serve the squares in a bowl of soup. 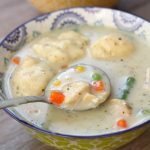 This is the absolute perfect comfort food!! 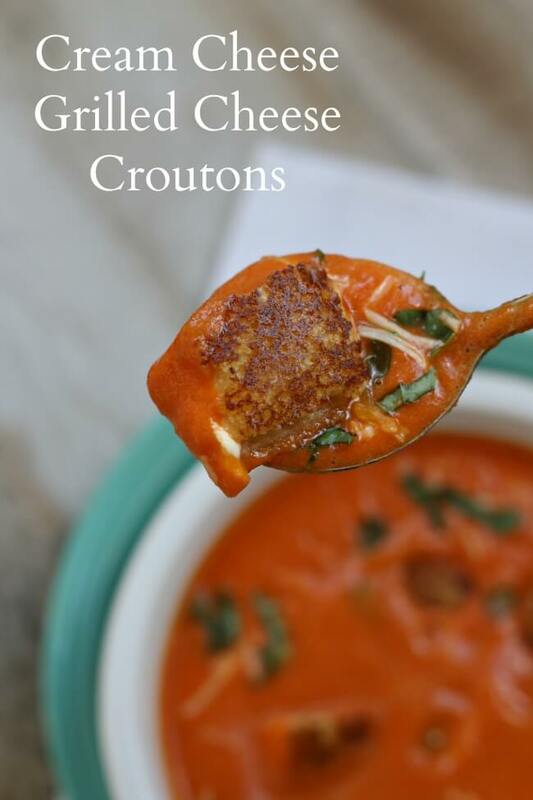 I’m definitely trying making croutons like that…I never would have thought to do that. 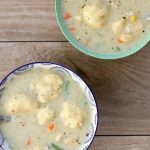 And that soup looks so delicious!